The text of this mellifluously fervent motet from the 1607 Gradualia is the so-called ‘Golden Sequence’, proper to Pentecost, a prayer for the coming of the Holy Spirit. 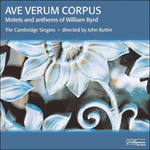 Facing the challenge of a longer-than-usual text, Byrd skilfully contrives to set the words concisely and without repetition, yet without the slightest sense of haste or lack of overall coherence. The opening invocation ‘Veni’ is as simple and effective as can be imagined. And in heaven felicity. Amen.